The Tenth Air Force was constituted on 4 February 1942, and activated at Peterson Field, Colorado, on the 12th of the month. The first commander was Col. Harry A. Halverson, who would later lead the famed Halverson Provisional Group, HALPRO. Between March-May 1942, the organization moved to India, its first base being at New Delhi. Maj. Gen. Lewis H. Brere-ton was the commander until 26 June, when he was relieved by Brig. Gen. Earl L. Naiden. Gen. Brereton was assigned a special mission in the Middle East. Subsequent wartime commanders, in sequence were: Maj. Gen. Clayton L. Bissel, 18 August 1942; Maj. Gen. Howard C. Davidson, 19 August 1943; and Maj. Gen. Albert F. Hegen-berger, 1 August 1945. On 2 May 1944, the Tenth Air Force moved to Myitkyina, Burma, then to Piaradoba, India, on 15 May 1945; on to Kunming, China, on 1 August 1945; and was finally located at Liuchow, China, between 9 August-15 December 1945. Its only heavy bombardment unit was the 7th Bombardment Group. This unit had a complex beginning during the early stages of the war in the Pacific; therefore its presentation will be different. 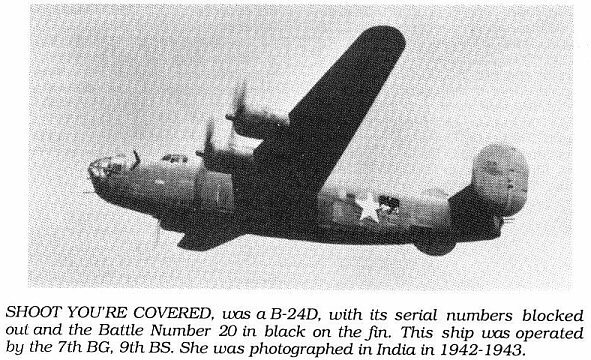 In addition, the 24th Combat Mapping Squadron, equipped with F-7s (camera-equipped B-24s), was assigned to the Tenth Air Force. Wartime commanders of the 7th BG were: Maj. Stanley K. Robinson, unk-29 January 1942; Maj. Austin A. Strauble, c. 29 January-3 February 1942; Col. Cecil E. Combs, 22 March 1942; Col. Conrad F. Necrason, 1 July 1942; Col. Aubrey K. Dodson, 27 March 1944; Col. Harvey T. Alness, 6 November 1944; and Col. Howard F. Bronson, Jr., 24 June 1944. The 7th Bombardment Group was en route to the Philippines with its B-17s when the Japanese attacked Pearl Harbor on 7 December 1941. The ground echelon, on board ship, was rerouted to Australia and subsequently sent to Java. Six of the groups' B-17s arrived at Pearl Harbor during the attack, but were able to land safely. Later in the month, the remainder of the unit's B-17s flew from the United States to Java. The 7th BG fought a valiant battle in the Netherlands Indies, losing many of their aircraft. For their action in this theater, the 7th BG was awarded their first Distinguished Unit Citation (DUG). Only a single squadron's-worth of aircraft were consolidated into the 9th BS and made their way to Karachi, India, on 12 March 1942, where they became part of the Tenth Air Force. The 7th BG's remaining three squadrons re-equipped with LB-30s and B-24s. The B-17s eventually made their way to North Africa under the command of Maj. Gen. Louis H. Brereton, Tenth Air Force commander, and the remaining 9th BS was equipped with both LB-30s and B-24s. Both the decimated 11th and 22nd BSs arrived in India in March and were temporarily equipped with LB-30s. On 26 April 1942, the squadrons were attached to the 17th BG in Karachi, India and trained in B-25s before being reassigned to the 341st BG, a medium bombardment group in the Tenth Air Force which was equipped with B-25s. The 436th BS was the fourth of the original squadrons assigned to the 7th BG in 1936. This B-17 unit took a delay in the Hawaiian Islands after 7 December 1941. The air echelon of the 436th BS was attached to the 31st BS, part of the 5th BG, between 10 December 1941-8 February 1942. The 436th BS was then attached to the U.S. Navy between 8 February-14 March 1942, and flew maritime reconnaissance missions from Nandi Airport, Fiji Islands, and Townsville, Australia. The 436th BS rejoined the 7th BG in India on 12 March 1942, where it transitioned into B-24s. The 492nd BS has lineage back to the 80th Aero Squadron which was organized on 15 August 1917. The unit was redesignated the 492nd Aero Squadron on 1 February 1918, and demobilized on 13 February 1919. Subsequently, the 492nd was a reserve squadron which was disbanded on 31 May 1942. It was constituted as the 492nd Bombardment Squadron (Heavy) on 19 September 1942, and activated at Karachi, India, on 25 October 1942, as part of the 7th BG, and equipped with B-24s. The 493d BS was constituted on 19 September 1942, and activated along with the 492nd BS at Karachi on 25 October 1942. The reorganized 7th BG bombed Japanese targets in Burma, consisting of airfields, locomotive works, fuel and supply dumps, railways, bridges and shipping docks. Bombing the railroads was fraught with frustration as the bombs would glance off of the rails or rail beds only to explode in the weeds. Both the B-25s and B-24s developed a spike -bombing technique to cope with the situation. A steel spike, which protruded 15 feet, was installed in the nose of a 100-pound M-60 bomb. When dropped, the spike would hold the bomb in position. This technique allowed the bomb to detonate on the rail line, and not be deflected. The first spike-bombing mission, with B-24s, was flown on 20 May 1944. The AZON bombs consisted of a 1,000-pound M-65 bomb equipped with a set of radio-steerable tail fins and a flare installed in the tail of the bomb. Using a control box with a stick, the bombardier could visually follow the flare in the bomb and steer the bomb to the left or right in order to ensure that the bomb would strike the target. Because of its steering limitations in azimuth directions only, the bomb was named AZON for AZimuth ONly. The transmitter had six available frequencies, thus permitting the simultaneous control of up to six bombs. The AZON equipment arrived in the Tenth Air Force inventory in the fall of 1944. Ten specially trained crews arrived from the United States and became an integral part of the 493d BS, 7th BG. Many of the bridges had been struck repeatedly, only to be repaired by the enemy. Other bridges were extremely difficult to hit and became the first targets for the AZONs. On 27 December 1944, three B-24s each made three passes, dropping one bomb per pass, on the Pyinmana Bridge, ending two years of frustrating failures. During a 15-day period, and under the guidance of the special team, seven AZON missions were flown and 127 bombs were dropped. The results were 14 bridges destroyed, one probable, and two possibly destroyed. Mechanical failures were listed at two percent. The most famous target hit by Tenth Air Force B-24s was the By-Pass Bridge. On 5 April 1945, the bombers made their drop from 6,000 feet and took out 60 feet of the span and damaged both approaches. This bridge became the subject of the novel and subsequent movie - Bridge on the River Kwai. On 24 April 1945, the 7th BG dispatched the 40 B-24s to bomb bridges along a 200-mile segment of the Burma-Thailand railway. Both low-level and dive-bombing techniques were employed. In addition, the 493d BS used AZON bombs. The results on the bridges were: 30 destroyed, six probably destroyed, and seven damaged, along with track damage at four places. The 493d BS destroyed 19 of the bridges with their AZONs.